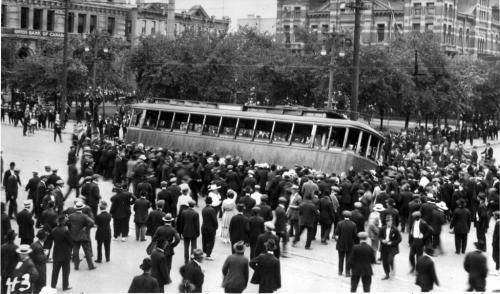 WINNIPEG – Today marks the 96th anniversary of the 1919 Winnipeg General Strike where over 25,000 workers walked off the job in support of fair wages, and better working conditions. “As we draw closer to the 100th anniversary of this historic event, we are reminded of the sacrifices of those who came before us in the labour movement” said Kelly Moist, President of CUPE Manitoba “it is because of these sacrifices that we are able to continue to organize as a movement and fight for our members”. At 11:00 am on May 15, 1919, workers left their jobs and marched into the streets of Winnipeg, leading to one of the biggest labour actions Canada has ever seen. Strikers included both the private and public sectors, and ranged from garment workers to police officers. On June 21, 1919, the Royal North-West Mounted Police and hired union busters rode on horseback and fired into a crowd of thousands of workers, killing two and injuring countless others. According to the Canadian Labour Congress, approximately 36 per cent of all workers in Winnipeg are currently members of a union, translating into 133,400 Winnipeggers. “The 1919 strike means a lot to us as a union movement” said Moist, “it shows us the sacrifices working people are willing to make in order to better the working and living conditions for everyone”. On Friday, May 15,2015 at 7:00pm a commemorative event is being held at Winnipeg’s Ukrainian Labour Temple (at Pritchard and McGregor), including live performances from the musical Strike! and a panel on the legacy of the strike. CUPE Manitoba represents approximately 25,000 public sector workers in health care, municipalities, school divisions, energy, airlines, social services and childcare, post-secondary education, and more.